For the past two or three years She's So Rad have been moving adeptly between two identities: the lush shoegaze outfit and the game console disco version of 'Breakout'. Their long-awaited second album Tango, out today, goes some way towards reconciling their many styles. The oldest track here, 2012's bursting 'Confetti', sits alongside 'Say the Word', with its David Dallas rap. But I think it it's also a showcase for Anji Sami's role in the group. If their debut, In Circles, could have been taken for a Jeremy Toy studio project, Tango is absolutely the work of a band with two songwriters. Sami's cascading 'Cool It', with its mad Brian May lead break from Toy, is one of my favourite songs of the year and it's far from the only great thing here. That's available now on Bandcamp (along with the option for a limited-edition hand-numbered CD), on iTunes and via Spotify. And they're playing an album launch show at the King's Arms tonight. The Other Crate Record Fair is on tomorrow from 9.30am at Allpress Gallery, 8 Drake Street (by Victoria Park Market) and it has a slightly different angle this time, centering on curated selections from the crates of five local DJs: Sir-Vere, Stinky Jim, Dbhead, Selecta Sam and Average White DJ. Jim has put together some words and pictures about what he'll be offering up. But it's the name that's not on the poster that might get a few folks excited. The great Nigel Horrocks is letting go some of his jazz collection. Whoop. A bit of Friday fun. Some of the folks at Music 101 have been musing over a potential New Zealand Music fantasy First XV and Zen Yates-Fill has had a crack here. I'm not sure about some of his picks – and even his colleague Samuel Flynn Scott is emphatic that there are too many small folk. 12 and 13: Anika Moa and Hollie Smith. Shayne's dalliances with the round-ball game set him in good stead as a pivot. Stylish, tough and, importantly, popular with the ladies. What do you want in a halfback? You want fast hands, that's what. More mobile than he looks – it's all the golf – and absolutely the guy you want calling it from the back of the scrum. Tall, athletic and creative – and always a lineout option. Handily, already has the number. The Luke Romano role. Good-natured off the paddock, an enforcer in the tight. Busy around the fringes, but also a surprisingly strong scrummager. A thinking loosehead. Disruptive at scrum-time, more than useful around the track. Over on Audioculture, Andrew Schmidt tells the story of Sweetwaters in two parts: Sweetwaters on the rise - 1980 to 1982 and Sweetwaters on the wane - 1983, 1984, 1999. 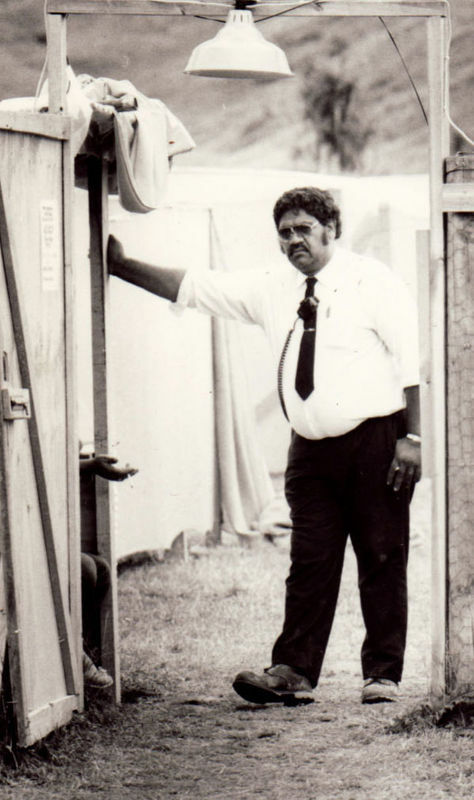 Included is this Murray Cammick pic of everyone's favourite security guy, Alby, who if memory serves me correctly, was a former traffic cop. Andrew is also the author of a very welcome profile of Bruce Russell. Another good read: Twelve Questions with Ashley Page, who got the top honour at the Music Managers Federation awards this week. It ranges from how his dad Larry fell out with Ray Davies to how he came to manage Joel Little. One Percent Collective has four questions for Music 101's Melody Thomas. Vanguard Red finds out what High Hoops is feeling right now. And Spin runs a bunch of tunes (including 'Pink Frost'!) past UMO's Ruban Neilson, shedding light on his musical soul in the process. And one from the video crate: NZ On Screen has the lovely Gemma Gracewood-fronted ukulele doucmentary Bill Sevesi's Dream. There's quite a bounty of tracks this week. Notably, Boycrush is back with a new tune (free download!) featuring Madeira (aka Kim Pflaum, formerly of Yumi Zouma). The drums are louder than they were on his debut EP Everybody All the Time; it's lush, light and delicious pop with a groove. From the Girls on Top EP due for release on May 27. 'Bohannon' isn't just the name of a track on the last Fat Freddy's Drop album. It's also the stage name of cult disco producer Hamilton Frederick Bohannon. This remix (free download!) doesn't stray too far from the drowsy blues of the original. This is an epic piece - which I can't just process just now. I note a recording “Ice-floe-sized bursts of sonic debris” that Bruce made at the Auricle in Christchurch in late 2013 is now available. Also on same bill was Roy Montgomery's "Less is More" - both can be downloaded as mp3 files. Tremendous crowd singalong to finish ‘Water Underground’. Good lord. That girl can sing! So why doesn't she SING, then?! Makes me sad in so many complicated ways. Indeed it was Rob. And a glorious sunset to boot. I note Bruce has done some subsequent shows at the Auricle: End of the Alphabet, No Mean City and this one with Peter Kolovos. A bit off topic, but can I bring to your attention, "Cider With Roadies", Stuart Maconie's account of his time writing for NME from around 1987, preceded by his contact with pop music since his mum took him to see the Beatles at the age of three. Wonderfully well written and hilarious. Amazon UK listing. It's been a bit of an off topic thread - and here's another one. R.I.P Ian Curtis, 35 years ago today. Sorry I'm a little late to this party but I'm heartened the over 35s are starting to appreciate Miley's chops, not to mention her mastery of her own destiny. I'm a fan. Plainly if Disney does nothing else it teaches you to sing properly.